Slate roofs are the king of long-lasting roofing materials. Unlike any other material, slate can last well past a century with little or no maintenance. But the benefits of slate roofing don’t stop there. If you are undecided about which material would be the best for your home or business, contact Red Dog’s Roofing today for our free roofing analysis. Regardless of which material you choose your roof will be installed by experts to ensure a job done right. Let’s take a closer look at one of the best roofing materials in the trade, as well as some of its drawbacks. As we just mentioned, slate lasts. Since slate is literally rock solid, it can last well beyond a century on your roof. 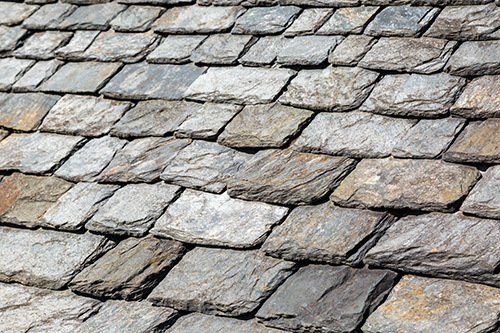 In addition, slate is one of the most beautiful roofing materials (more on that below), slate won’t catch fire, and slate is a relatively eco-friendly option. Unlike asphalt shingles and wood shakes, slate is completely fireproof. Plus, since slate is simply flat stone that is quarried from the earth, attaining slate has very little impact on the environment. All of these benefits stack to make your home more valuable. 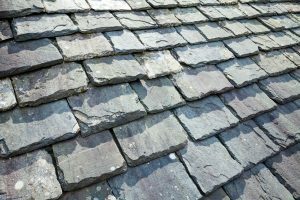 Now, let’s take a look at some of the cons that come alongside slate roofing. Slate is heavy, expensive, difficult to match, and it can be damaged if improperly installed or maintained. Now how expensive is slate? Well you could spend around 10 times the amount to purchase and install slate tiles as you would if you were to buy an affordable asphalt roof. However, slate holds its value, and asphalt shingles will deteriorate and require replacing. Slate is also the heaviest roofing material. As such you’ll have to ensure that your roof is built to handle all that weight, or you’ll have to shell out additional cash to retrofit your home with the support necessary to hold such a heavy roof. Finally, proper installation is crucial, and caution is necessary. Your roofing installer will have to take care to place tiles delicately to ensure that they don’t shed any layers or crack. These tiles will require replacement. Over the lifetime of your slate tiles, you’ll have to take caution not to allow an untrained professional to walk over the surface of the tiles, since they’re likely to crack under the pressure of a person’s weight. Slate roofs are simply beautiful. The natural stone provides a bit of glint as it catches the sun. In addition, the tiles aren’t completely uniform. Some tiles will have textures and imperfections which give your roof a subtle, graceful texture. Slate can also come in a variety of colors. When you select a slate color, you’ll receive tiles that have been quarried from the same dig site; and all of these tiles will be similar in coloration. Now, as we mentioned, this may make tile difficult to match, but you can purchase a few dozen extra tiles to ensure that you have backup tiles to match your roof should any damage occur. Here at Red Dog’s, we take roofing seriously. We strive to provide an unparalleled product and unbeatable service. That’s why we’re an Owens Corning™ Preferred Contractor company—meaning that our team is highly trained and certified to install, repair, and maintain roofs. We know roofing through and through, which enables us to work on both flat and sloped roofs. We work with all sorts of roofing materials too, ranging from PVC to metal to asphalt. Learn more about our full list of roofing services, and schedule an appointment today!